LOL! This guy is just adorable floating on his shell! You've done a brilliant job with your coloring here Connie! I know the feeling without a paddle though! LOL! Enjoy your weekend! This is brilliant and sure made me chuckle. Wonderful image and great colouring too. Love how the turtle is using his shell as a boat! Such a fun card! This is adorable! I love that turtle - how cute. Thanks for joining us this week at Scrapy Land! Very cute!! I love how he is using his shell as his little boat! The "splash" die cut is a fun touch. Thanks for playing with The House That Stamps Built. This is so adorable!! He's so cute!! I love the design!! Thanks so much for playing along at Scrapy Land!! 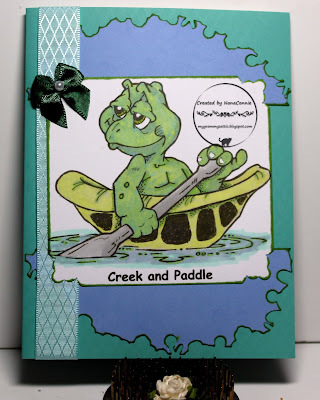 Love it, such a fun card card and that turtle is just fab.